Upscale townhome w/ river access, great views, & game system. Get ready to live like a local in this gorgeous Deschutes Landing townhome with a lovely interior and great views! Located in the middle of Bend's historic Old Mill District, enjoy Bend from its very heart and leave your worries behind you. 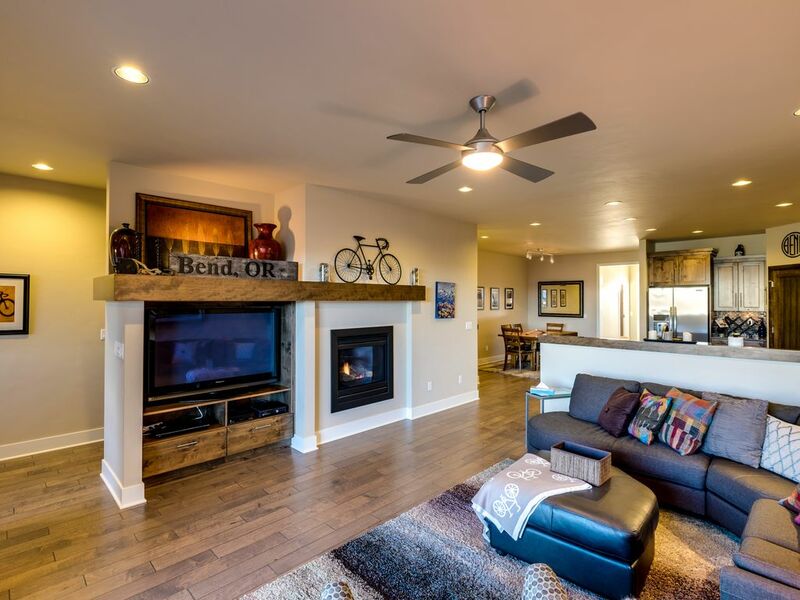 Close to everything, with access to all the urban and outdoor adventures you could ask for, this lovely townhouse will make your next stay in Central Oregon a luxurious one! This home has a spacious, lovely interior with tasteful decor, a warm fireplace, and great entertainment amenities like WiFi, cable, an XBox gaming system, a Bose Bluetooth speaker system, and 200 different movies. The home has an amazing outdoor accommodation for your cook-out needs: the porch and deck offer amazing views of the Deschutes River and the Cascade Mountains. Let the grill master loose on the gas grill, and kick back. Winter keeping you inside? The full kitchen with state of the art appliances and all the necessary tools and trinkets will make your cooking and dining experience a pleasant one to share with everyone! Enjoy three bedrooms, each with its own bathroom - one king, one queen, and two twins, plus a blow-up mattress make this home comfortable for a group of eight maximum. A few couples enjoying a ski trip together or a large family will enjoy this condo's luxury. Of course, there's so much to do now that you're in Bend! Skiing, hiking, rafting, fly fishing, or just mulling around shopping are some favorite past times; enjoy fireworks on Independence Day from Pilot Butte, or a local concert at Les Swabs Amphitheater. Whatever you decide to do, enjoy the finest living Bend has to offer during your next excursion to Central Oregon! Parking Notes: The garage is a tandem. Please park on the side street if your car leaks fluids. Thank you! Not bad to say at all. Nice house. Very well stocked. Couldn't find dishwasher and laundry soap. Definitely will rent again. A beautiful home! Great location. We loved this rental. Great kitchen and layout. Close to everything. The only issue was the poor quality TV in the living room. We appreciate your feedback and will contact local staff to see if the Homeowner would like to purchase a new TV for guest satisfaction. We spent a few days in Bend looking at properties for building a home and couldn't have been happier with our choice of places to stay. This very clean and comfortable condominium is only steps away from the Deschutes River Walk and the Old Mill District. A short six or seven minutes from the great restaurants of Old Bend (downtown). If you are coming to Bend and want a great place to stay, we'd highly recommend this property. Very comfortable for six guests, maybe more. This house was absolutely perfect for three couples enjoying a birthday weekend in Bend together. I would book this house over and over and over again. The home is on three levels with open very long and steep staircases. We had our one year old grandson with us and did not think to bring baby hairs with us. This would be something to consider if you have small children or have problems navigating stairs. Overall wonderful accomodations!!! Eight women stayed here utilizing all of the beds, sofa, and air mattress. Having three full baths in the main living area made it very doable. Additionally, a bath in the garage which was well lit and warm gave an additional area for putting on makeup, etc. The downside to this bath was there was a shower but no curtain and a shower head that was not adjustable to where the water pointed. It is really more comfortable for six people. The kitchen was well equipped. We only prepared breakfast and snacks for happy hour. The location was excellent for walking to the Old Mill and using Uber to get downtown so we didn't have to struggle to find parking. Would definitely utilize this property again.